ReCell Center will develop better recycling processes. Recycled materials from lithium-ion batteries can be reused in new batteries, reducing production costs by 10 to 30 percent, which could help lower the overall cost of electric vehicle (EV) batteries to DOE’s goal of $80 per kilowatt hour. To spur development of new recycling techniques and new battery designs, DOE’s Vehicle Technologies Office (VTO) within EERE dedicated the ReCell Center today at DOE’s Argonne National Laboratory. The ReCell Center, DOE’s first advanced battery recycling research and development (R&D) initiative, is a collaboration between Argonne; the National Renewable Energy Laboratory (NREL); Oak Ridge National Laboratory (ORNL) and several universities including Worcester Polytechnic Institute, University of California at San Diego and Michigan Technological University. Collaborators from across the battery supply chain, including battery manufacturers, automotive original equipment manufacturers (OEMs), recycling centers, battery lifecycle management services and material suppliers, are working with the center. The ReCell Center is supported by DOE with $15 million over three years and its work will include development of test beds and a process scaleup facility at Argonne. Modeling and analysis tools will be developed and utilized to help direct an efficient path of R&D and to validate the work performed within the center. University and national laboratory collaborators will use state-of-the-art R&D tools at their home institutions to develop new methods for separating and reclaiming valuable materials from spent EV batteries. Researchers will then scale up the most promising technologies at the ReCell Center facilities located at Argonne, where industrial collaborators can explore the technologies and develop them further. The center will be a collaboration space for researchers from industry, academia and other government laboratories to use R&D tools not found at their own laboratories and to grow pre-commercial technologies. “The ReCell Center will help expedite the pursuit to profitable lithium-ion battery recycling. 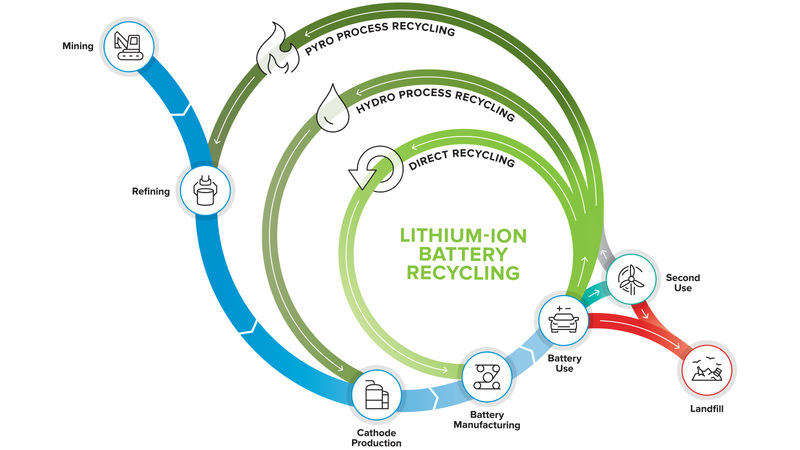 It combines the nation’s leading experts and research tools from academia, industry and government laboratories to solve science challenges that have prevented the U.S. from reaping the economic, environmental and security benefits that come with having a large commercial U.S.-based lithium-ion recycling market,” said Jeff Spangenberger, director of the ReCell Center.